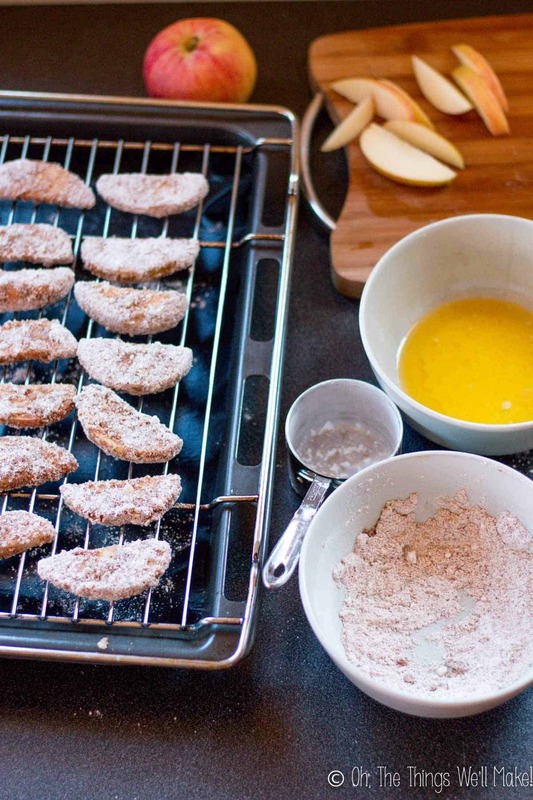 Paleo Baked Apple Fries - Oh, The Things We'll Make! 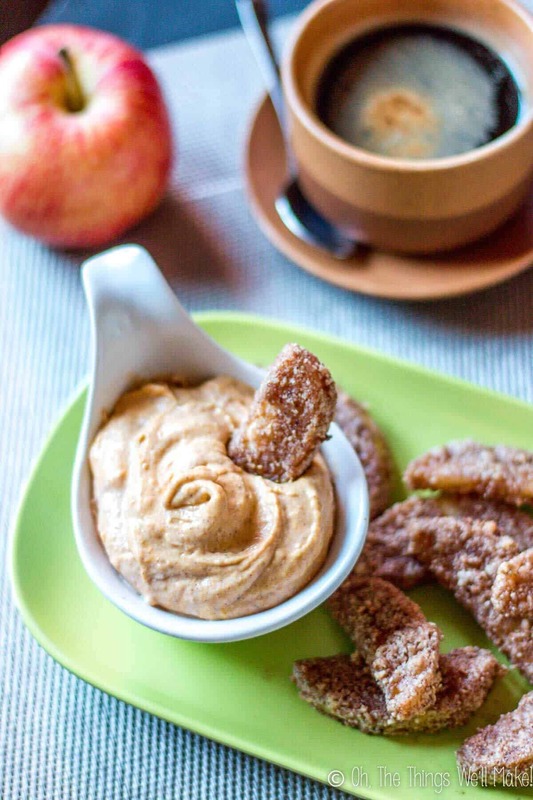 Crispy on the outside, sweet and soft on the inside, these sweet, paleo baked apple fries are perfect for dipping in my sweet pumpkin pie dip. 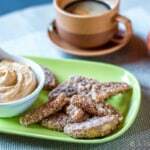 Paleo baked apple fries served with pumpkin pie dip. The other day I was playing around with the leftovers in my fridge and accidentally made the most amazing pumpkin pie dip, and I had to share it with you immediately. My son and I had been eating a bunch of organic apples, and earlier in the week, I had made pumpkin fries. I guess that all inspired me to “invent” apple fries. So, while I can't claim to have invented apple fries, I can at least work on making a healthier alternative to the ones that are served at fast food restaurants. I decided to bake my apple fries, and I also kept them grain free. Overall, I think they turned out really well. I haven't had the ones at Burger King, so I can't compare or even pretend to know if they are even similar, but my son and I enjoyed them. Another great thing about making these yourself is that you can control the quality of the ingredients. I don't always buy everything organic, but apples are always towards the top of the dirty dozen list for fruits and veggies that take on the biggest toxic load, so it's one of the foods I pretty much will only eat if organic. If I have to be completely honest, I'm not a huge fan of baked apple desserts like apple pies or dumplings. (I know, I know- crazy, right?) I still really liked them. That said, I'll admit that I prefer eating the pumpkin pie dip with raw, crunchy apples. I'm weird that way. When I first made this recipe, I used ghee to help coat the apple slices with the coating because I always happen to have homemade ghee on hand, and I love the buttery flavor it gives. That said, you can just as easily use coconut oil instead to make this recipe vegan-friendly. If you don't want the apple fries to take on a coconut flavor, use expeller pressed coconut oil, or another oil with little flavor of its own. 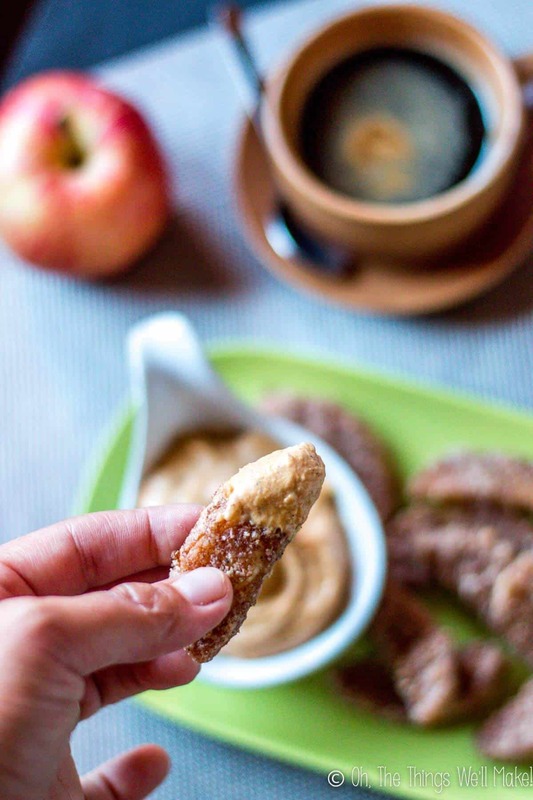 Crispy on the outside, sweet and soft on the inside, these sweet, paleo baked apple fries are perfect for dipping in my sweet pumpkin pie dip. Makes around 16 slices. Preheat the oven broiler to a high heat broiler setting. You want a very high setting to get the outside of the apple fries crispy without the apples getting too soft for dipping. Mix together the tapioca flour, almond flour, coconut sugar, spices, and salt in a small bowl. Dip the apple wedges into the melted ghee or butter, and then immediately dip them into the mixture of dry ingredients to coat the apples. Place coated apple wedges on a grill over a baking sheet in a single layer with space between them. Once you have finished coating and placing all of your apple wedges on the grill, place the baking sheet/grill in your oven near the broiler and broil on high heat until the coating brows and gets slightly crispy. Flip the wedges over and grill until the other side is also finished. Serve immediately. They are great with the pumpkin spice dip. About how long would it take for the coating of the fries to be browned? It’s really hard to say because it depends a lot on your oven. To be honest, I haven’t made these in awhile, so I don’t really remember how long it took in my oven. It wasn’t very long under the broiler, and you have to keep a careful watch so as not to burn them. Love the sound of these! I bet I too would have thought I invented these if I came up with this! Never seen apple fries before but need to make them soon!